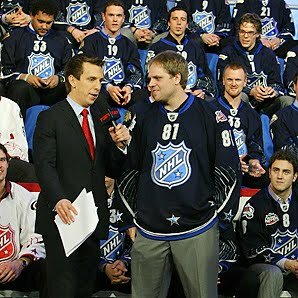 Another NHL All star game is upon us and it will another that I probably won't watch. All star games are a complete snorefest whether its baseball, football or basketball. All offense and zero defence. I know it for the fans, mostly the younger ones, but I could never sit through something so boring. Last night, I was channel surfing and I came upon the All star teams being selected. This year the NHL had the players select their respective teams by doing a mock draft. There were two teams - team Eric Staal since the game was being held in Carolina and the other team was captained by Nicklas Lidstrom. This had all of the elements of when I was a youngster and we were picking teams. As expected all of us didn't want to be the last one picked, because that meant you were a loser. As expected the best of the crop was quickly snatched and lo and behold the final two were Paul Stastny of Colorado and Phil Kessel of the Leafs. Of course, Kessel was selected last much the laughter of every Leaf hater especially when Staal made the comment before selecting Stastny "Since it's not a hockey market in Toronto" that was a crack at Leaf Nation several years ago during the playoffs when they drove down in busloads and commented that Carolina wasn't a hockey market. Leaf Nation as expected had conspiracy theories galore. Kessel was the NHL equivalent of the fat, nerdy kid in grade school. Instead of a visor, he should be wearing thick glasses with tape across them. I wouldn't be surprised to see Ovechkin give Kessel an atomic wedgie on the bench and his teammates slapping a KICK ME sign on his back. He took it in stride and for his troubles he won a car and 20 grand donated to his favorite charity. It could been worse, if the game was held in Toronto, he would of been pelted with waffles.